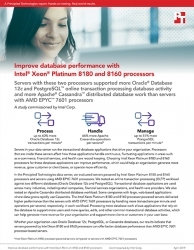 Principled Technologies (PT) evaluated Oracle Database 12c and PostgreSQL online transaction processing database activity and Apache Cassandra distributed database work on servers powered by Intel Xeon Platinum 8180 and 8160 processors and servers using AMD EPYC 7601 processors. Durham, NC, April 09, 2019 --(PR.com)-- The processors that power e-commerce, financial services, or health care organizations’ data center severs can have a big impact on transactional database application performance. In a new study commissioned by Intel Corp., Principled Technologies found that whether an organization uses Oracle Database 12c, PostgreSQL, or Cassandra databases, servers powered by Intel Xeon 8180 and 8160 processors can offer better database performance than AMD EPYC 7601 processor-based servers.